(Nanowerk News) A team of chemists led by Carnegie Mellon University's Rongchao Jin has for the first time conducted site-specific surgery on a nanoparticle. The procedure, which allows for the precise tailoring of nanoparticles, stands to advance the field of nanochemistry. The surgical technique developed by Qi Li, the study's lead author and a 3rd year graduate student in the Jin group, will allow researchers to enhance nanoparticles' functional properties, such as catalytic activity and photoluminescence, increasing their usefulness in a wide variety of fields including health care, electronics and manufacturing. 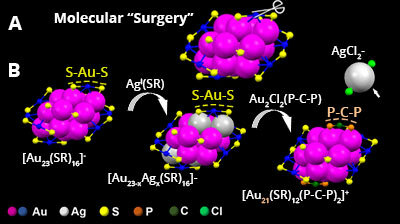 The findings were published in Science Advances ("Molecular “surgery” on a 23-gold-atom nanoparticle"). In their recent study, Jin and colleagues performed nano-surgery on a gold nanoparticle made up of 23 gold atoms surrounded by a protective surface of ligands in staple-like motifs. Using a two-step metal exchange method, they removed two S-Au-S staples from the particle's surface. In doing this they revealed the structural factors that determine the particle's optical properties and established the role that the surface plays in photoluminescence. Significantly, the surgery increased the particle's photoluminescence by about 10-fold. Photoluminescence plays a critical role in biological imaging, cancer diagnosis and LED technology, among other applications.